Chart and Yod are two hit-men who are equally skilled at their jobs. They work under the supervision of Trai, the right-hand man of Madame Louise, the leader of an underground drug dealing business in Thailand. This makes Chart and Yod compete against one another to become number one. They are constantly competing and fighting against each other over every matter. Trai then sent the two on a mission to deliver Kookitno drugs, a new type of drug, to a client. Therefore, the two must be careful not to get followed or caught by the police, especially Police Colonel Cherdsak Chaya, who is heavily driven by his job as a narcotic police. Kookitno drugs are unique in that they produce faster side effects. Once ingested, one will quickly fall asleep and begin to hallucinate severely. In addition, when combined with the stimulant of music, the drug's effect will increase even more. If ingested beyond the recommended dose, it will drive a person mad to the point of killing others, committing suicide, and overdosing from the drug's toxicity. While on duty to deliver the drugs, Chart was secretly ambushed, which resulted in him falling off the cliff. Police Colonel Cherdsak sent Police Lieutenant Sakchai, an undercover spy for the police, to disguise himself as Chart because he looks similar to Chart. He underwent surgery to look exactly like Chart even if Sakchai didn't quite agree with the method. This was a top secret case. Meanwhile, drug dealers from Hong Kong and Cuba want to hire Yod to steal Kookitno's secret drug formula. Yod accepted the offer because they were willing to pay him a very high price for the job. Even though the deal was made top secret, it was unable to escape the ears of the DEA (Drug Enforcement Administration). Yod then met Rasamee, a tourist guide. He fell in love with her and asked her to take him and the drug dealers on a tour in Chiang Mai not knowing that she's actually an undercover cop. When Lieutenant Sakchai awoken from surgery, they were ready to make the switch. The police had gathered every bit of information about Chart from his past history and personality traits to ensure they impersonate Chart accurately. When Sakchai woke up to see his face, he was so unhappy that he ran away and bumped into Trai. Trai then brought him to rest at the mansion because he thought he was Chart. He called Becky, Chart's lover, to come take care of him. Becky knew that this Chart wasn't the same Chart, but she didn't say anything. Furthermore, Pai Lu is a famous Chinese singer from Hong Kong. She is also an undercover cop who is working for China to bring down the criminals behind the Kookitno drug trade. All three undercover cops will some how cross paths and work together to bring Madam's Louise drug trade to an end. 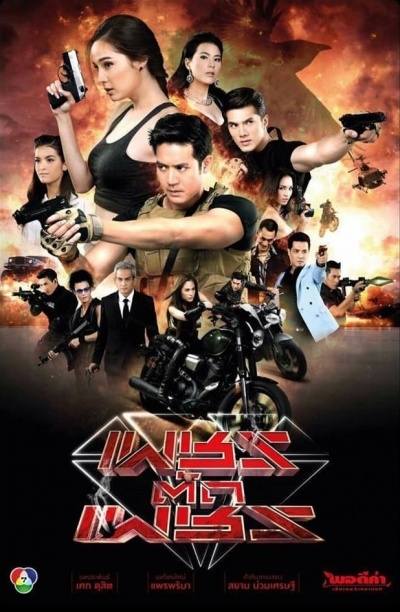 This is a remake of Aum Patcharapa and Jetrin's action lakorn Petch Tud Petch (2001). This lakorn will be Weir and Kwan's second lakorn together after first pairing 8 years ago in Dung Duang Haruetai (2008). This lakorn experienced copyright issues that could have interfered with its airing. The story was written by two authors. Channel 7 bought the copyrights from one author while Kunchai Kumnerdploy (Num) from Channel 8 bought copyrights from the other author. Channel 7 could not air it unless they receive permission from both authors. Fortunately, the copyright issues were resolved. After leaving Channel 7 to collaborate with other channels, this is Natharika Thamapreedanan's first collaboration with her home channel in 15 years. This is Korkwan Restall's debut lakorn. This page was last modified on 28 October 2018, at 00:52.